Last month, BMW launched the BMW M5 “30 Jahre M5”, a limited edition of the popular sedan that celebrates 30 years since the first M5 model came to market. 300 units are being produced globally with 29 of them being sold to U.S. customers. Starting at $138,275, including destination and handling, the first 29 copies of the 30th Anniversary Edition BMW M5 were offered to the first 29 customers on May 21, 2014. And now one of them ended up on eBay with a price tag of $200,000. This is car one out of 30 produced for the U.S. market, one of them reserved for BMW North America. The owner says the limited edition M5 will be delivered within 4-5 months. So what makes this M5 so special? First, the power output of the limited edition M5 with Competition Package was raised to 600 horsepower and 700 Nm (516 lb-ft). The super powerful sedan now sprints to 62 mph in just 3.9 seconds. This power boost has been achieved through tweaks to the engine management and an increase in charge pressure. Second, it features an unique Individual color shade Frozen Dark Silver metallic. 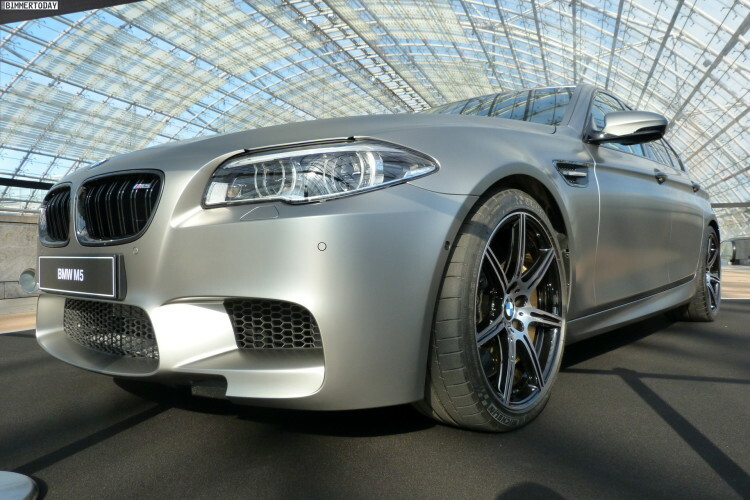 Other differentiating elements are the kidney grille surround, gills with “30 Jahre M5” badge on the front wing, door handle inserts and twin exhaust tailpipes all come in black chrome, adding subtle yet effective accents to the car’s appearance. The same is true of the 20-inch bi-colour M light-alloy wheels with mixed tyres (front: 265/35 ZR 20, rear: 295/30 ZR 20). The interior of the BMW M5 “30 Jahre M5” is also focused squarely on celebrating the model’s 30th anniversary. For example, the driver and front passenger will be greeted by “30 Jahre M5” lettering on the front door sill finishers, while a plaque bearing “30 Jahre M5” and “1/300” inscriptions in reference to the special edition’s limited 300-unit global production run is integrated into the Aluminium Trace trim strip on the front passenger side of the cabin. The “30 Jahre M5” logo is also embroidered into the backrests of all four of the high-performance sedan’s seats. “30 Jahre M5” special edition is a high-end surround-sound system with a total of 16 speakers. Customers can choose between a Harman Kardon unit with output of 600 watts and a 1,200-watt Bang & Olufsen high-end surround-sound system. The eBay listing can be seen here.